Tour Destination: Welcome to the Tiger’s Heaven!!!!!! 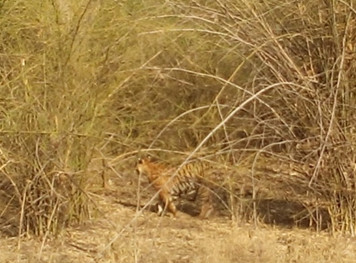 Meet the wild tiger on nature (while in safari) in these tiger’s Heaven place in India. Though these areas of central India has hub of tigers, we named these places like this. This itinerary has special designed for Nature lover, wildlife photographer and who really love to see this big cat on nature, which includes the jungle book place- Pench National Park, unspoiled of nature- Nagzira wildlife Sanctuary & the famous Tadoba National park. Upon arrival Nagpur airport meet our representative and transfer by road to Pench National park. Overnight at a nice resort. 2 Jeep safari and rumble around the jungle to meet the wild tiger on nature (chances is more to sighting near the water body). Overnight at the same resort. Early morning again one jeep safari inside the national park. After lunch drive towards Nagzira wildlife sanctuary, upon arrival check in a nature camp or a resort. During two Jeep safari and rumble around the jungle to meet the wild tiger on nature ( chances is more to sighting near the water body). Overnight at the same resort. Morning during jeep safari meet many carnivorous and herbivorous on nature. After lunch drive towards to Tadoba National Park. Upon arrival check in a nice resort at there and relax. (Here chances of sighting have more than 80%). D8-Tadoba National Park- after breakfast departure for Nagpur airport for your onwards destination. Caution: Try to obey the jungle rule accordingly in order. Respect the Nature and Enjoy the Nature !!!!!! Pench National park: It is located on the southern boundary of Madhya Pradesh, bordering Maharashtra, in the districts of Seoni and Chhindwara.Pench National Park, comprising of 758 SQ Kms, out of which a core area of 299 sq km is the national park and and remaining 464 sq km is the buffer area. Safari by : open hued maruti jeep with jungle guide ( mandatory; provide by forest department at the entrance gate)//Maximum no. of Guests per safari jeep – 6 pax. (Excluding driver and jungle guide). Nagzira wildlife sanctuary is located in the Bhandara district of Maharashtra at21°15′24″N80°1′30″E. This sanctuary has a number of fish, 34 species of mammals, 166 species of birds, 36 species of reptiles and four species of amphibians. The invertebrate fauna includes, besides a number of insects and ant species. 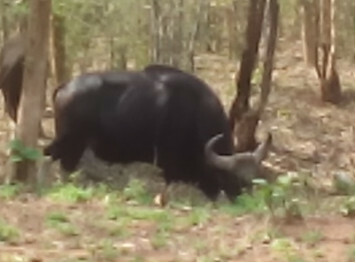 Wild animals found here are the tiger, bison, sambar, nilgai, chital, wild boar, sloth bear and wild dog. There are also ten tigers, panthers and one elephant. Best time to visit: March to June; in winter- 15 oct. to Feb. Park closed: During Monsoon- 15th June to 14th Oct. But entry permit for the sanctuary directly in the entrance gate. Tadoba National Park : – Tadoba Tiger Reserve is the pristine and unique eco-system situated in the Chandrapur district of the Maharashtra State of India. The Reserve contains some of the best of forest tracks and endowed with rich biodiversity. It is famous for its natural heritage. Tadoba Tiger reserve was created in 1995. The area of the Reserve is 625.40 sq. km. This includes Tadoba National Park, created in 1955 with an area of 116.55 sq. km. Best time to visit: February to May // Park closed : During Monsoon- July- Aug- sept.
Safari by : open hued maruti jeep with jungle guide ( mandatory; provide by forest department at the entrance gate)//Maximum no. of Guests per safari jeep – 6 pax. ( excluding driver and jungle guide). 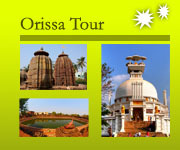 Tour Destination: Here in Odisha the old palaces introduced as a heritage accommodation and hospitality now a day, so here this package is not so expensive like other part of India. We keep add here this new package for explore the royal heritage test of these palaces with unique sightseeing in and around. Such as Bhitarkanika national park, Killajodi, ancient Budhist monastery as well as Mahima sadhus monastery, textile village, artisan village, tribal community like Saura and Bhumiya ,Chilika Lake, Puri, sun temple-Konark and many more. Upon arrival Bhubaneswar meet our representative and transfer to Ali palace. If time permit visit the Malar village nearby. Overnight at Ali palace. Morning drive towards Bhitarkanika National Park, meet the wild crocodile basking on sun ray on natural creeks while boating in side of the park. Hiking inside the core area to meet the natural fauna such as spotted deer, wild boar, jungle fowl, water monitor lizard and different types of bird on nature. Overnight stay in the same palace. After breakfast drive towards to chowdwar palace and enroute excursion the ancient ruined Budhist University (Mahavihar- stupa- chaitya) at Ratnagiri and Udaygiri. Overnight stay in the nice palace of killajodi. Morning hiking for Saura tribe village (5km total). Saura: one of the colourful tribe in India, 5000 year our Mythological book – Ramayana and Mahabharata mention Saura tribe name (accordingly anthropologist Saura is an Aryan tribe of proto-austoloyed race). Afternoon visit Bhumiya tribe village and also rose garden (100 different verities of flower is at there). For relaxing try to meditate in the meditation centre nearby. Visit the unique textile village at Maniabandha –famous for tie and dye pattern, while return back to Dhenkanal meet the Dokra craft men at their village and excursion their metal casting handicraft. Check in the royal palace of Dhenkanal. 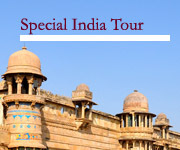 Free afternoon to excursion the palace and Rangamahal. Visit the tribal jewellery making village at Karamul and after noon Joranda Mahima religion live monastery and enjoy the unique pattern of worship during sun set by the Mahima sadhus (The supreme sadhus use only lean bark to covering their lower part). Overnight in the same Heritage palace. Visit the classic part of Puri by cycle rickshaw trip such as cremation place( swargadwar), old pond, bit walking on old street , marshal art place and also Jagannath temple( non Hindus are not allowed in it , so they will see that temple on the top of old library ). And also artisan village –Raghurajpur. (Where we arrange the classic Gotipua dance exclusively for you). Afternoon visit the world famous sun temple at Konark- excursion the language of stone on 13th c AD. If time permit see the illumination of temple. Overnight stay in the same palace. Meet the wild Irrawaddy dolphin on nature while boating (3hr) on chilika lake and also visit the mingling point of Bay of Bengal and chilika lagoon – popularly known as sea mouth. 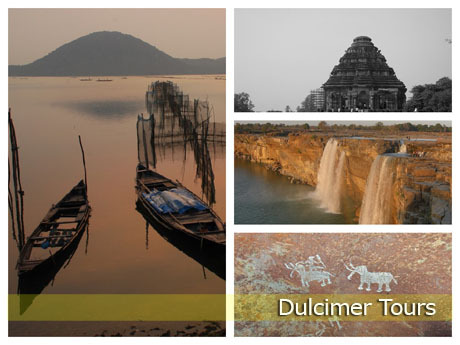 While returning visit the ancient temple (500 year) on chilika. Overnight at the same palace. Morning check out and departure for Bhubaneswar airport/ railway station for your onward journey . Morning after breakfast at the royal garden, check out and proceed to Kumbalgarh meet the colorful Garacia tribes at their village ,also meet the one of the famous tribal group in india- Bhopa tribe (whose eyes are green color) explore and excursion their life style and then check in a nice heritage palace at Kumbalgarh. Enjoy the royal hospitality at there. take place at the fair. It is believed that the fair is held on this ancient site since antiquity. The fair is also one of the most important matchmaking melas (fair) as the tribal youths visit Tarnetar to find a suitable match. Its association with the Mahabharat is underlined by the fact that the area was known as Panchal Pradesh, the land to which Draupadi belonged. 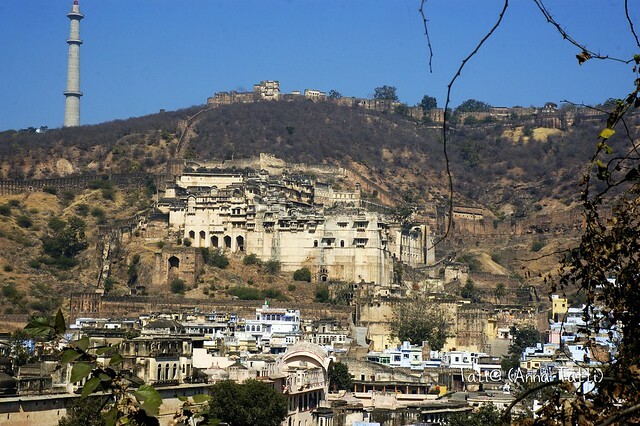 The fair is linked with the story of Draupadi’s Swayamvar and it is said that it was at this place that the great archer Arjuna performed the difficult task that won him his bride. Over 300 stalls are set up in the fair that sell numerous objects and offer various types of food and refreshments. There are exhibitions of embroidery, a cattle show, competitive sports, family planning stall, merry-go-rounds and photographer’s stall. The folk music and dances like the Garba ras and hodo are the main features of the fair. 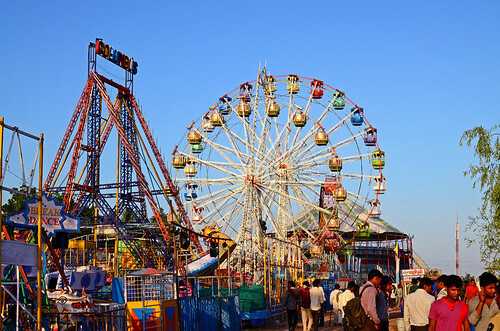 Location of the fair is organised in Tarnetar village some 39 kilometres from Chotila in Surendranagar District in Gujarat. It is popularly known as the Trinetreshwar Mahadev Mela and revolves around the sacred temple of Trinetreshwar. Even now, the tradition of swayamvar has survived and unmarried men and women from the Bharwad and other tribal community visit the fair in search of a match, attired in their traditional clothes. Men stand under exquisitely embroidered umbrellas signifying their marital status while women go around the umbrella hunting for their grooms. Cattle exhibition is an attraction for the tourists with other programmes like ‘Rural Olympics’, bullock cart race and horse race is held at Tarnetar. Local arts and crafts display is an added trade attraction. 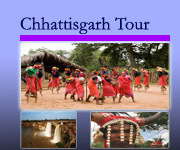 The tourists have an opportunity to learn the folk dances like the Hudo and Raas dance of the Maladhari community. 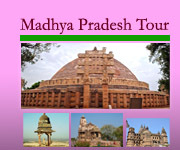 Heritage monuments are a sightseeing attraction at the venue place. Tarnetar Fair venue provides accommodation in tents and kuba houses for the tourists. A mix blend of culture, tradition and social extravaganza, the Tarnetar Fair has gained popularity with more foreign tourists visiting the place. Navratri, that means ‘nine nights’ is an ancient, colourful and religious festival of Gujarat. This festival is celebrated to honour the one Divine Shakti or Force which supports the entire universe and is personified as the Mother Goddess. The Mother Goddess protects her worshippers, destroys evil and grants boons to her children. Navratri is celebrated with joy and enthusiasm throughout the Gujarat, but in Ahmedabad and Baroda, Garba and Dandia dances are performed. This festival is celebrated with true devotion in the various temples which are dedicated to the Mother Goddess. In this festival, the women perform the Garba dance or the circular dance around an earthenware pot called a garbo which is filled with water. A betel nut and a silver coin are placed within the pot, on the top of which a coconut is placed. As the dancers whirl around the pot, a singer and a drummer also accompanies them. The participants clap in a steady rhythm. The dance usually starts slowly and gets fast with the music. In large public areas, group of musicians sing the traditional garba songs. The Dandia ras or ‘stick’ dance is also performed during Navratri. Both the men and women perform the dance in circle, holding small polished sticks or dandies. As per the rhythm of the dance, men and women strike the dandies together, adding to the joyous atmosphere. These dances are so popular that sometimes competitions are held and prizes are given to the best dancer. The dancers worn the traditional costumes, alive with colour. The dances usually commence late in the night and continue until early morning. A Bhavai dance is also performed in the Ambaji temple at Baroda, during Navratri. 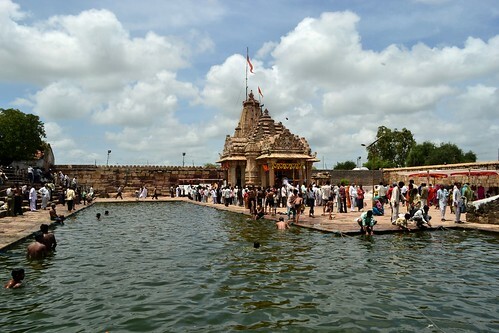 This fair is held every year at Vautha, where two rivers , the sabarmati and the Vatrak meet, vautha fair site is also known as Saptasangam as it is at the confluence of seven rivers. Legends says the elder son of shiva and parvati- Kartik, visited the site. So this fair is dedicated to Kartikeya and is held during Kartika Purnima, the full moon night of Kartik ( Oct- Nov) . the most important shiva temple here is the Siddhanath . 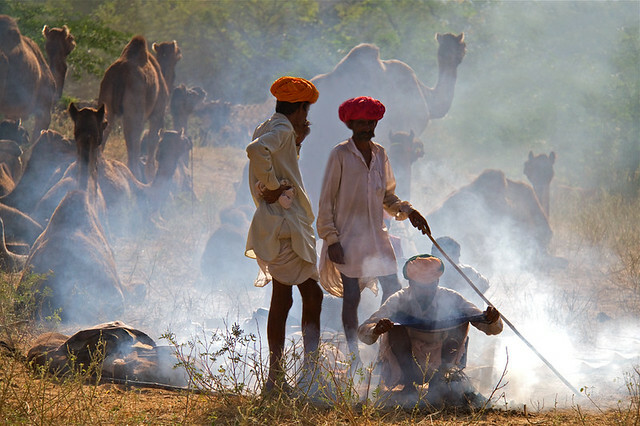 The most significant about this fair is that it is the only major animal trading fair in Gujarat ad is on par with the famous camel fair at Pushkar, Rajasthan. Howerver the only animals traded here are donkeys. About 4,000 donkeys are brought every year for sale, usually by vanjara traders. Donkeys are painted in different colors and decorated and this is a major highlight of the fair. Vautha Mela attracts more than 500,000 people.the pilgrims who visit Vautha during the fair are from several communities farmers, people belonging to several castes. Every spring in Gunbhakari, at the confluence of three rivers in North Gujarat, Garasia, Gamar, Khair and Pargi tribals get together for Chitra Vichitra Mela, the biggest tribal mela near the village of Poshina in the StateIt is one of the largest tribal fair in india, thousands of tribes gathering in the confluence point to three river Sabarmati, Akul and Vyakul to offering their ancestor. 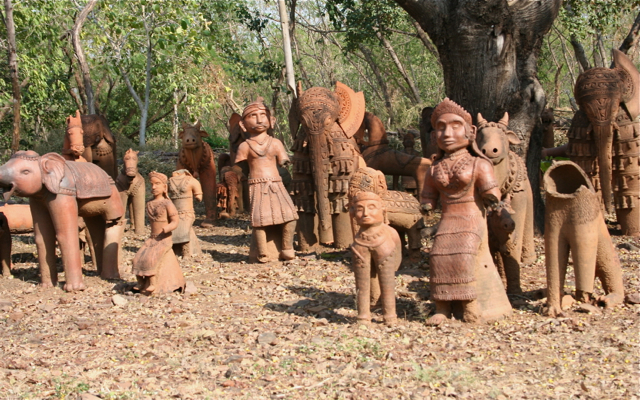 The fair attracts large numbers of Bhils ( tribals). The costume of the men genrally consists of a blue shirt, dhoti and a red or Saffron turban. 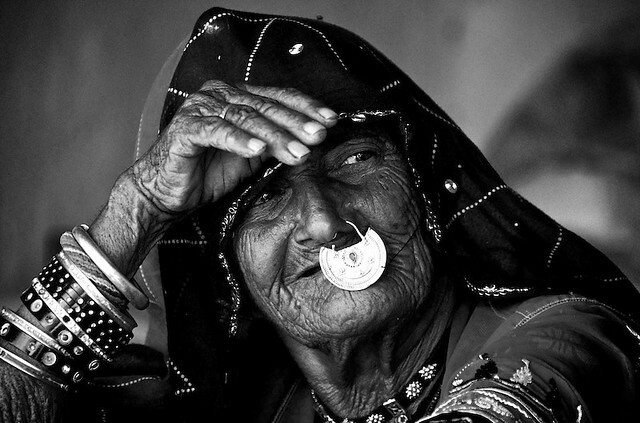 Women use ghaghras , which have a circumference of as much as 20 yards (18 mts), and are covered from head to foot With ornate and heavy silver jewellery. They use liquid Vermilion to color their cheeks and lips a nice red color, while their eyes are Outlined with Kajal. Every group that comes ot the fair carries with the different musical instrument and the atmosphere come alive with the Incessant beat of numerous drums. The women sing folk songs and folk dances are performed. Diwali, the festival of lights is a four-day festival celebrated in the month of Asvina, which marks the end of the harvesting season. 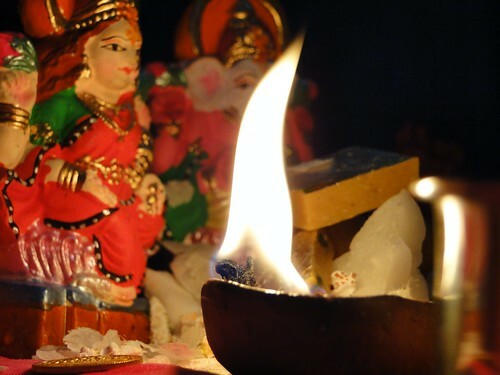 The first day of the festival starts with the Lakshmi Puja. The second day is considered as the day of casting off evils. The third day is the main Diwali day. On this day every home is illuminated with earthen lamps and the courtyards are decorated with Rangoli designs. The fourth and the last day is the New year day for the Gujarati’s when people visit temples in colourful costumes and greet each other. The day following the new year day is called the Bhai bij day when brothers are invited by their sisters to partake of sweets with them. The full moon day of the Kartika month, with its preceding eleventh (ekadashi) day is called the Dev-Diwali. On these days the marriage of the Tulsi plant with the Shaligram, symbolising Lord Vishnu, is celebrated in every Hindu home in Gujarat. It also marks the end of the fast, observed for the four months of rainy season, during which Hindus, mostly ladies, miss a meal on every Ekadashi day. The International Kite Festival is celebrated on 14th January, that coincide with the festival of Uttarayan or Makar Sankranti. The festival is celebrated to mark the end of winter. On this day, the kites flew all over Gujarat, including Ahmedabad and Baroda. The people eat the special food on this day in the open field or in the park or in the garden of one’s home. This festival marks the movement of the sun into the northern hemisphere. The gods who are believed to have gone in a long sleep for six long months awake and the portals of heaven are thrown open. The visitors visit the temples and alms are distributed freely. The kite flying starts at dawn and continues without a pause throughout the day. Friends, neighbours and total strangers battle one another for supremacy and cries of triumph fill the air when they cut each other kites. 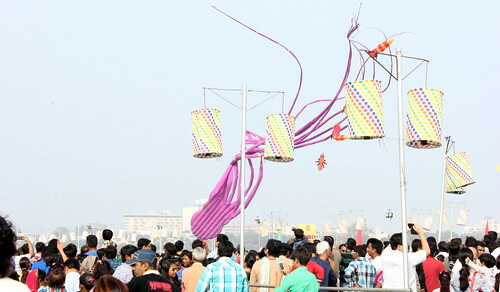 The thread which is used to fly the kites are specially prepared by experts before the final day. Special mixtures of glue and ground glass cover the thread which is dried and then rolled onto reels known as firkees. In the night, various illuminated box kites, known as tukkals, fly in the sky. Today, the International Kite Festival is famous all over the world. This festival enables the people of Ahmedabad to see the unusual kites brought by the visitors, some of which are truly works of art. The Modhera Dance Festival is held during the third week of January every year, after the festival of Uttarayan. This festival is celebrated at the Sun Temple in Modhera. The style in which the temple was built bears a strong resemblance to that of the Jain temples at Mount Abu. 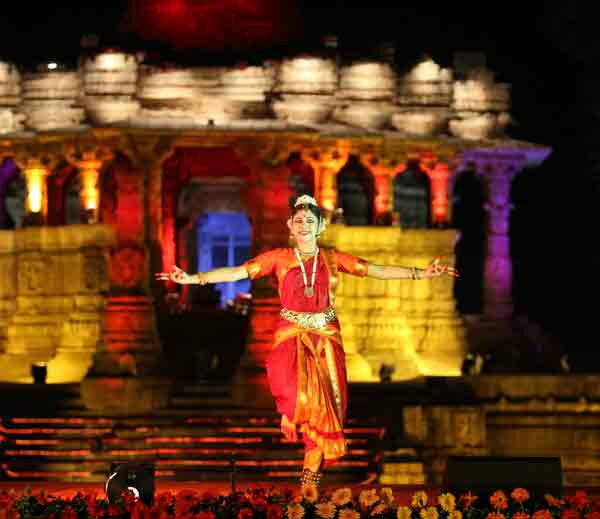 The decision to celebrate the annual festival of Indian classical dances was taken by the Department of Culture, Gujarat, and the West Zone Cultural Centre at the Sun Temple. The idea was to present classical dances in an atmosphere similar to that in which thes Uttarayan. To based given festival date we can prepare instant itinerary for you , please add just arrival and departure date rest you leave on us.